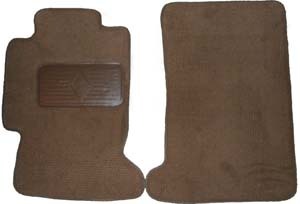 Eclipse Covers offers quality floor mats. These are not ordinary floor mats. Our automobile mats are manufactured to fit the exact year, make and model of any vehicle. With over 4000 patterns in our library, we can fit most any car, truck, SUV or Van. This includes passenger, cargo, or trunk areas. These quality mats accent a new car with a personal touch or brighten up the interior of any pre-owned vehicle. For a personal touch we also provide custom embroidery. Densely woven 24 oz. carpet is 100% nylon for durable wear, and is completely washable for lasting beauty. Nibbed vinyl backing keeps the mat in place. Not available on Runners. The embroidery letter size is 1 to 1.5 inches in height.